The annual Helm of the Year event took place on Saturday 22nd September. The winningest helms from each fleet (based on results in the Spring and Summer racing series) represent their fleet in a closely fought sailing regatta in Picos. The event takes place over seven races, with competitors swapping boats each time to ensure no undue advantage/disadvantage from the boats. The goal is to see off the competition and become Helm of the Year. Serious stuff. 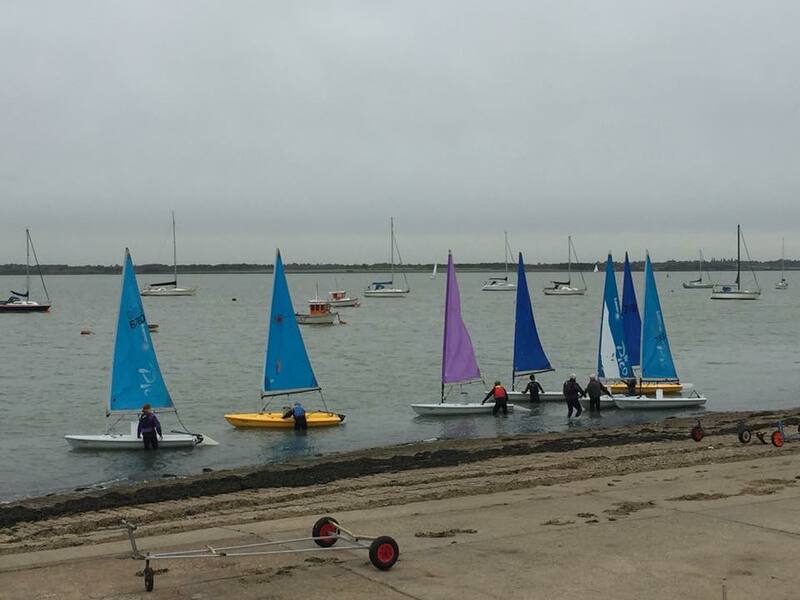 Seven competitors took part – Jason Clarke (Cadets), Julie Spencer (Slow H’Cap Fleet), John Burgoyne (H’Cap fleet), Jenny Ball (Sprint 15), Steve Thomas (Medium Cat), Will Harrison (Fast Cat), Ian Ivermee (Cruiser). Nigel James was Race Officer, assisted by Jon Pearse and set a course off the club with a committee boat start and finish. Jason took an early lead in Race 1, closely followed by Jenny and John. Jenny managed to get inside Jason at the end of lap one and just about held off Jason and Jon to take the first win. Will Harrison led the start of Race 2 with Jenny, Jason and John hard on his heels but he held his nerve and took the win. In Race 3, Jenny forgot that Pico’s don’t get the start line as quick as a Sprint 15 so was late starting. Will, Jason and John battled at the front with Julie and Ian not far behind and Will went on to take a second win. A change of course and the fleet went back out for Race 4 with Will taking a third win. The fleet came in for lunch and in view of the weather, Ian and Julie decided to quit before they froze in the drizzle. After lunch, the wind looked promising as the fleet headed out for Race 5. Will led off the line with Jason and Jenny close behind. This time John had got his times muddled up and was late for the start line. As Will, Jason and Jenny rounded D mark, the wind stopped altogether making it difficult to cross the ebbing tide on the way back to G. John, in the meantime, was able to round D about the time that a light breeze came back giving him yards of advantage over the top three. John sailed the light conditions extremely well to eventually take the win, with Jenny taking second. The fleet came back out for Race 6 in light conditions, and although the tide was not at its Blackwater strongest, it took patience and concentration to get the Picos over the line against the tide. Jenny managed to edge a lead at the first mark with John and Will close behind and Jenny managed to just hold them off to take the win. With discards, a quick calculation worked out that the title was hanging in the balance on the last race between Will and Jenny. In ever lighter conditions, the fleet changed boats on the water at the committee boat. Jenny, Will and Jason managed to get across the line and away – whilst John and Steve decided that a tow home was more favourable than another hour folded up in the front of a Pico. Jenny led to the leeward mark, turned for the finish and stopped in the tide. Will and Jason did the same. Then a breath came in from first the west and then south west which Will picked up first and got to the line to take a well deserved win of the race and the title. Big shout out to Ian, Julie, Steve, John, Jason and Will for some fantastic racing in light conditions that were not forecast (apart from the drizzle), to Dave Clarke, Tom Clayton, Lee Harrison and Pat Shaw for being shore support. Thanks to Nigel Baker and Tony Goode providing RIB support in less than ideal conditions. And massive thanks to Jon Pearse and Race Officer Nigel James for running the event and finding creative course to get all 7 races in despite the failing breeze. And congrats to Will Harrison for becoming 2018 Helm of the Year! Andrew is Marconi Sailing Clubs webmaster. He sails a Tornado Sport Catamaran and Sprint 15.